Get ready for the adventure of a lifetime at the TreeUmph Adventure Course. 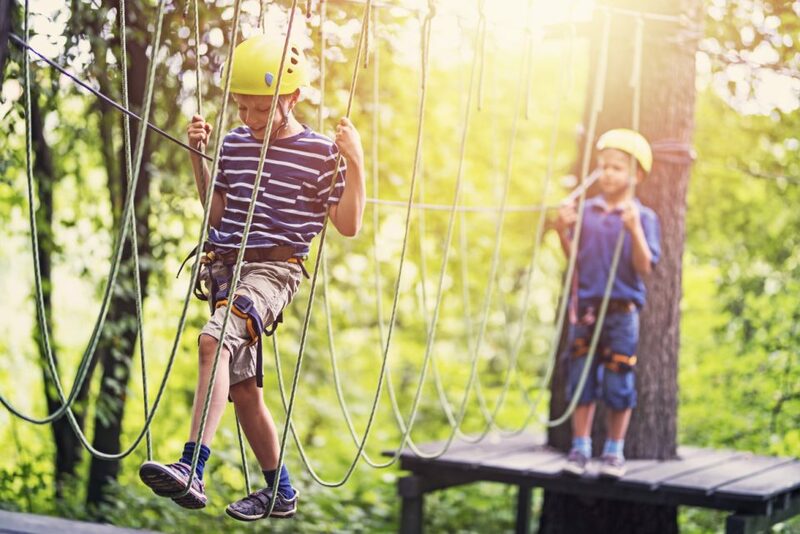 This 14-acre park has five adult courses, children’s courses, treetop adventure games, hanging nets, bungee swings, zip lines, and so much more. From gliding through the trees to free-falling up to 60 feet, this is a one-of-a-kind adventure. Adult tickets are $54.95 and include access to all five adult courses and the zip line. Junior tickets are $36.95 and include access to three adult courses and the zip line. Children’s Ape Up tickets are $25.95 and include access to three trips through the Ape Up course. Annual passes start at $130. Here’s what you need to know before you head to TreeUmph. You won’t just be unleashed on the courses when you arrive. An instructor will teach you about the various moves and equipment you’ll use on the course. You won’t get started until you’re ready, so don’t worry. You’ll have the skills necessary to tackle the various courses by the time you hit the first one. Afraid of heights? Don’t let that stop you from going to the TreeUmph Adventure Course. The courses start pretty low to the ground so you can work up confidence as you move from one to the next. By the time you get to the higher courses, you’ll have your bearings and your confidence. Not convinced? The staff will be right there to help you out, and you have the option to stop at any time. Some people make it all the way through while others decide to opt out. Knowing that you can stop at any time will give you the confidence you need to get started. Some of the courses are quite challenging, and you need to be ready. You’ll need to use your upper body strength to make it through the courses, and you’ll notice you’ll get a bit depleted the closer you get to the end. Fortunately, you can prepare for that by hydrating ahead of time. Start drinking lots of water two days before you go to the park. Then, buy the unlimited water pass. It costs $4 and will give you access to bottled water. That bottled water will be the best thing you’ve ever tasted after you work up a sweat on the course. You’re going to have a wild adventure at the TreeUmph Adventure Course. Why should the fun end just because you’re going home? Keep the good times rolling right along with the help of a new Honda from Hendrick Honda Bradenton in Bradenton, Florida. It’s easy to go from one adventure to the next when you have a Honda.